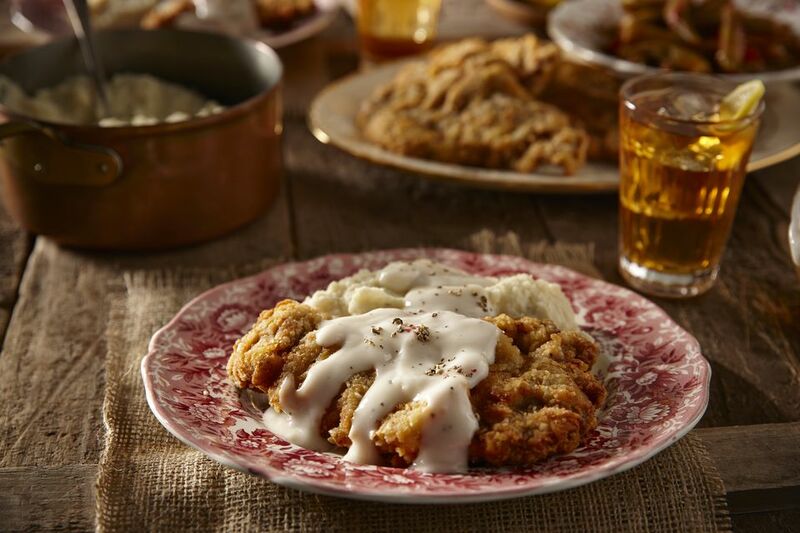 This is an easy version of chicken-fried steak, a typical Southern dish consisting of pan-fried breaded steak cutlets, often smothered with gravy. Cube steak is the cut of meat most commonly used in country-fried steak. Either top round or top sirloin, cube steak gets its name from the square indentations left on the meat after the vigorous tenderizing process that occurs during production. Similar to Wienerschnitzel, a German dish of breaded and pan-fried veal cutlets, country-fried steak is thought to have been brought to the American South by Germans. Although the terms country-fried and chicken-fried can be interchangeable, some people distinguish country-fried as a steak cutlet dusted with flour, pan-fried and served with brown gravy, and chicken-fried as breaded using eggs, pan-fried and smothered in a cream gravy. The gravy recipe here is creamy, utilizing only two ingredients--cream of mushroom soup and milk--making for a super quick weeknight dish. Heat oven to 200 F or warm. Combine flour and pepper in a shallow bowl. Whisk together the egg and buttermilk and pour it into a second shallow bowl. Put cracker crumbs or unseasoned plain breadcrumbs into a third shallow bowl. Dredge cubed steaks in the flour, dip into the buttermilk, then coat with the cracker crumbs, pressing with your hands if necessary to coat thoroughly. As each cutlet is coated, place on a baking sheet covered with aluminum foil or parchment paper. Melt shortening in a large skillet over medium-high heat. Cook steaks, in batches, if necessary, for about 3 minutes on each side, or until nicely browned and cooked through. As completed, place steaks on the baking sheet (first remove the foil or paper and discard). Place the steaks in the warm oven while making the gravy. Drain off most of the excess fat from the skillet, leaving the dregs, or browned bits. Add soup and milk to the skillet drippings, stirring and scraping up browned bits from the bottom of the skillet. Continue cooking, stirring constantly, until mixture comes to a boil. Serve steaks with the hot, creamy gravy.